The senator rejects a presidential bid—again—but her backers are undeterred. Fortune magazine announced Tuesday that it had obtained “the final word on a White House run” from Elizabeth Warren. “No,”replied the senator from Massachusetts. That blunt response came amid a burgeoning “Ready for Warren” movement to draft the outspoken critic of Wall Street abuses into the 2016 presidential race as a progressive populist alternative to former Secretary of State Hillary Clinton, the as-yet-unannounced front-runner for the Democratic nod. The draft movement is real, and it has gathered traction nationwide. “Run Warren Run” activists are already working on the ground in the first caucus state of Iowa. 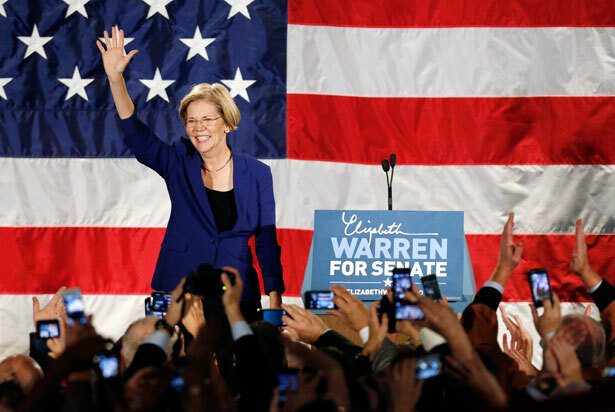 And, on Saturday, in Manchester, New Hampshire, Democracy for America and MoveOn.org Political Action members are set to formally launch the “Run Warren Run” effort in the first primary state. The advocates for a Warren run are not backing off. Those grassroots groups are right. Sincere draft efforts invariably begin with a reluctant candidate. The key is to stir up enough support to get a non-candidate—even one who says “no”—to reconsider. Draft movements have in the past succeeded in drawing disinclined contenders into nomination contests. In some cases, such as that of Dwight Eisenhower, the candidates go all the way to the presidency. In some cases, such as that of Henry Cabot Lodge Jr. in 1964, they have shaken up the competition. In some cases, such as that of Mario Cuomo in 1992, they have never really gotten off the ground—but they have locked up activists who might have backed other contenders. For now, it makes sense for the “Run Warren Run” initiative to continue. The caucuses and primaries are a year off. There are no looming filing deadlines. This is the clearest window of opportunity for activists who would draft a candidate into the presidential competition of either party. The Democracy for America and MoveOn folks are right that, in politics, the word “no” is not always a conversation-closer. It’s clear that a lot of Democrats, as well as independents who lean toward the Democrats, want an alternative—or several alternatives—to Clinton, whose past positions on war and peace, trade policy and corporate power have troubled progressives and populists within the party, as well as independents who lean to the left. Ultimately, there will come a point where activists must make a tougher choice: Do they turn the “Run Warren Run” campaign into a serious effort to secure support at the caucuses in Iowa? Do they launch a write-in effort in the New Hampshire primary? Do they do so even if other contenders—Vermont Senator Bernie Sanders, outgoing Maryland Governor Martin O’Malley, former Virginia senator Jim Webb, to name but a few prospects—have stepped up to place their names on the ballot? Do they run the risk of splintering support for an alternative to Clinton by steering votes toward a non-candidate when there are actual candidates?